This topic contains 14 replies, has 2 voices, and was last updated by knob twiddler 4 months, 4 weeks ago. When I install ctrlr on muy win7 ultimate x64 the VST version is not displaying correctly. Like there is a scale problem with it. That makes it unusable to me. I tried different versions and also checking my display options but all with no effect…can someone help please? Is it Reaper you are using here? Reaper does work fine on my Win10 x64. These screenshots do look strange. Where is the top menu bar where you can set Reaper specific features, like e.g. “Param” and “UI” buttons? I can read “x64 bridged” on the first screenshot. This means that you are using 32-bit plugin within Reaper x64. This does not make much sense – unless you want to provide 32-bit plugin for other people. Edit: oh no sorry. When it would have been a 32-bit plugin within Reaper x64 it would have showed “x86 bridged”. So you are probably using a 32 bit version of Reaper and load the Ctrlr 64-bit plugin. In case this is true: does that make any sense? This reply was modified 5 months ago by Possemo. Thanx for your answer. I am using Reaper 5 x64 and I installed x64 and x32 plugin in Reaper. Both look the same…does that help? Are you sure you are using Reaper x64? Screenshots suggest Reaper x86. Edit: I tried out this weird config Ctrlr-64bit within Reaper-32bit and seems to work flawlessly (see screenshot). Have you tried different panels? I have no idea what causes this screen offset. I am running my plugins as dedicated processes in Reaper. I guess that is why it is showing that bridging thing, but I don’t know much about it. So, if I understand correctly Ctrlr Standalone does work? I did’t know that you can run plugins in dedicated processes in Reaper. How do you set that? Maybe this does not work well with Ctrlr. 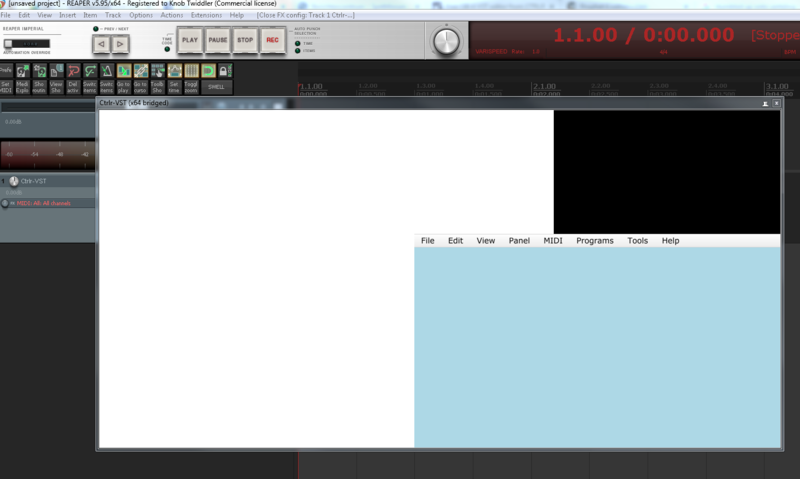 Look at the screenshots – this is how it looks on my Reaper-x64. Ctrlr-x86 is in bridged mode whereas Ctrlr-x64 is not. Btw. both do not have any weird screen offset. Ok I have found out how you force plugins into dedicated processes. Well, this does not seem to be the problem. As you see in the screenshot I tried it out. In this case Ctrlr-x64 is in bridged mode as well. No I wasn’t all that clear in my answer. Standalone always worked. With your advice to delete the preferences folder, the plugin is working as it should. Thank you! Do you think dedicated processes in Reaper are an advantage? I thought that a buggy VST could not crash my DAW when I run everything in dedicated processes. But if I understand you correct, in that mode, even x64 plugins are bridged again? I don’t know if dedicated processes are giving you any advantage. It probably depends on the plugin. I don’t know if bridged mode has any disadvantage compared to normal mode. It’s probably a bit slower but for Ctrlr this does not seem to make a big difference. I did a test with some plugins from mystery island. They are midi plugin like the ctrlr ones. The plugins crashed my DAW very easy because of the midi going in and out or when I was configuring the ports. When I run them as dedicated processes they are stable as hell…very strange…I was expecting the plugin to crash but Reaper to stay stable, but even the plugin is not crashing anymore. Anyway Possemo, I found ctrlr while looking for a midi editor for my OB-6 synth. I tried the Prophet6 version on this site (it should work with OB-6 too) but it looks like it is a very early beta version. 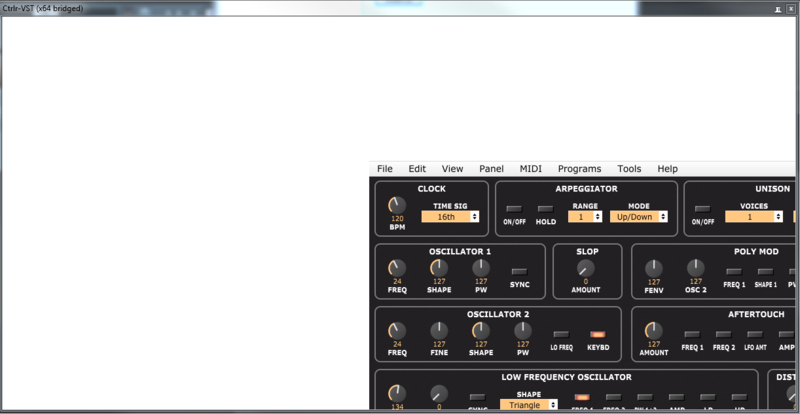 Only the plugin knobs are moving when I turn some on my synth but it does not seem to work in 2 directions. Exporting and importing sounds and banks was also not working. Too bad because it looked beautifull and very promising. I ended up buying an editor with the black friday sale (from codeknobs) and that one is working great.